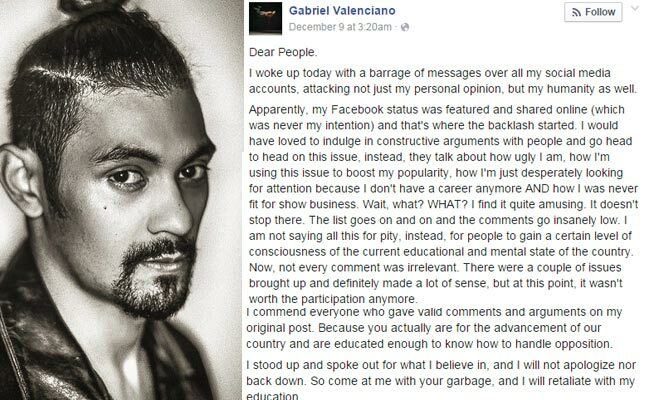 After receiving backlashes on his opinion about Duterte, Gab Valenciano took to his Facebook account last December 9 to defend himself. He said that after his post about the former Davao mayor, he received a lot of unnecessary comments about the issue. Valenciano claimed that netizens were criticizing even his personal life. He revealed that they were telling him how ugly he is and he was just an attention seeker who desperately wants to boost up his career. As a respond to these, he then posted that it was very saddening that the Filipino netizens became this low. His last Facebook post stated that he will not apologize nor back down on his opinion. Chito Miranda, on the other hand, a supporter of Duterte, posted on his Twitter account that we should respect each other's opinion and don't have to fight a person if he has different views. His post was very timely with what Valenciano has been experiencing. Meanwhile, Ramon Bautista received a lot of hate for his appearance in the "Fast Forward" music video along with other celebrities to promote Presidential candidate Mar Roxas and Vice- Presidential candidate Leni Robredo. He responded to it by saying that people criticized him without valid reasons and as a Filipino citizen he has the right to vote whomever he wanted, and he will be voting for Roxas. Gab Valenciano on His Controversial Post: Would You Hire a Murderer to Take Care of your Kids? Celebrities are just like us. They can support or not whoever they want to. They are still citizens who pay their taxes, anyway, therefore deserve equal rights. The difference is just that they are well-known public figures. It is very saddening that whether you're a celebrity or not, you can't voice out your opinion freely without being judge. Although Freedom of Speech has been ratified for democratic purposes, some netizens are abusing this so-called right that it is used to bash or to drag somebody's name to shame. On this upcoming election, we must be ready for the worst to happen. There will be a lot of black propaganda to be thrown at each candidates. Whatever it may, we must choose wisely and think who deserves to lead our country for betterment.